It’s official! San Luis Obispo is on the map, placed there first by M.Ward and now by critic’s darlings Port O’Brien. We’re just a sleepy little college town somewhere north of Santa Barbara, and we’ll take fame any way we can get it. Chardonnay, lo-fi indie bands… whatever. No matter that Port O’Brien now calls Oakland home. Van Pierszalowski and Cambria Goodwin, the group’s core duo, both come from SLO County. These guys have generated a well-deserved buzz with their new record “All We Could Do Was Sing,” self-released on May 13. Last night we attended a CD release party held at a vintage clothing store and brimming with folks who looked like they shopped there. (How could they afford it? Perhaps they shop at thrift stores and garage sales, like us.) Two bands opened the show, both solid acts in their own right, but we were particularly impressed with Sparrows Gate, who rocked in a loud alt.country way. They have a sound that falls somewhere between Drive-By Truckers and early electric Dylan, when he was backed by The Band. Bearded front man Zebedee Zaitz and his brother Anthony, on bass, look for all the world like the Avett Brothers, and they bring the same intensity to the stage. Fortunately they don’t break as many strings. Dig the harmonica and steel guitar, that’s real twang right there boys. A little later, Port O’Brien took the stage (meaning the rear of the store) and lo and behold, there were Zeb and Anthony in the band. First gig for the Port with their new bass player. According to Van, the brothers will be part of the group for the upcoming European tour. Too bad we couldn’t see or hear cute little Cambria’s banjo from the back of the room, since banjos ROCK. (Hey, this is supposed to be a folk music blog, why am I gushing about rock bands here? Oh yeah, it’s the music of the people.) 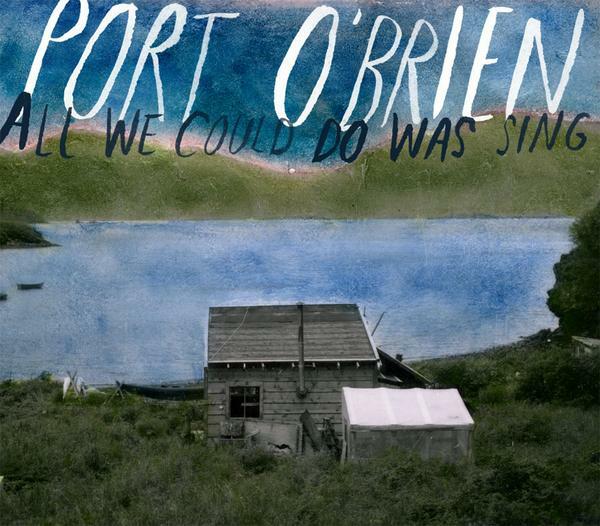 Port O’Brien’s music is reminiscent of Uncle Tupelo, in that the heartfelt songs—many written about commercial fishing in Alaska—range from quiet acoustic folk to loud thrashy walls of electric guitars, and while the sound might be a little rough around the edges, it’s got heart. As opposed to so much pop music today, which is smooth as silk and lacking a heart. We can’t wrap this up without a mention of their One Big Song, “I Woke Up Today.” Before closing the show with this tune, they handed out pots and pans to the crowd and asked us to mingle with the band in what quickly turned into a big happy singalong and percussion party. No fancy extended guitar solos, no premeditated bridge section, no smooth 5-part harmonies. Just pot-bangin’ and people singin’. If that ain’t folk music, I don’t know what is.